Add this issue to your photographic library for featured articles on ever ready camera settings, DPP, Canon's free RAW editing software program, plus stunning micro photography. New products EF-S 55-250mm f4-5.6 IS STM lens. 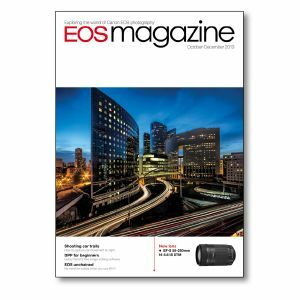 World of EOS Canon autumn cash back, firmware updates, remote resources. Ready and waiting Is your camera ready for the unexpected? We recommend the best settings for a fast response. Car trails Night time is the right time for colourful action photograhy - see 'Cover Story'. DPP primer Digital Photo Professional (DPP) is Canon's RAW converter and image editing software. How was it shot? Can people levitate? There is no Photoshop manipulation in these photographs by Anatoleya. Heavenly bodies Learn how to capture some stunning images of the moon, planets, stars and comet ISON. Ring of confidence Canon L-series lenses are the best you can buy for your EOS camera. Are they worth the extra cost? EOS unchained What is WiFi all about? We explorehow how this technology is used with EOS cameras. Microphotography Huub de Waard shows you how to capture images from the small world of insects - without a tripod. Freelance diary Miles Willis decribes a black-and-white assignment for Hampton Court Palace.